Theresa, a second-year starter, is not only is known for her runs up and down the field and bringing numbers to the attack, she also is a smart, quick thinker. That’s not surprising considering her excellence in the classroom. By the time she graduates next year, she will have taken 11 Advanced Placement (AP) classes. What’s more, her talents stretch way beyond the field. She is an author who wrote a novel in ninth grade under the pen name T Berry Jones, plays violin in the school orchestra, sings in the choir, and, after school in the off season, teaches STEM-related classes to elementary- age school girls. 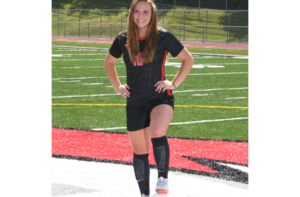 You can deduce that Theresa is motivated, hard-working, and competitive – traits that serve her on the field as well, especially after the new WPIAL alignment placed them with some of the best teams in the northern section of the WPIAL. Anchoring the other end of the field at forward and center midfield is fellow senior Sarah Sinnott, whose skills and abilities to distribute the ball and read the game earned her a scholarship to play at the University of Pittsburgh. 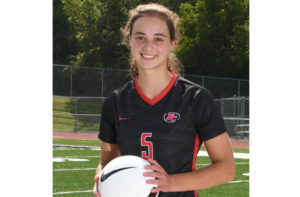 She also has been named to the WPIAL Class AAAA all-section first teams twice by both the Western Pennsylvania High School Girls’ Soccer Coaches Association and the Big 56 Conference. Additionally, last year as a junior, she was named to the all-WPIAL team. While the team started off the regular season with a revenge victory against non-section opponent Penn-Trafford, who eliminated them in the WPIAL semifinals last season, the team did drop that game against Butler in a tough fight, but bounced back to defeat North Hills and Shaler Area high schools the next week. The team successfully fought off adversity in the past on their way to earning three consecutive section championships and finishing as WPIAL semifinalists in two of the past three years. 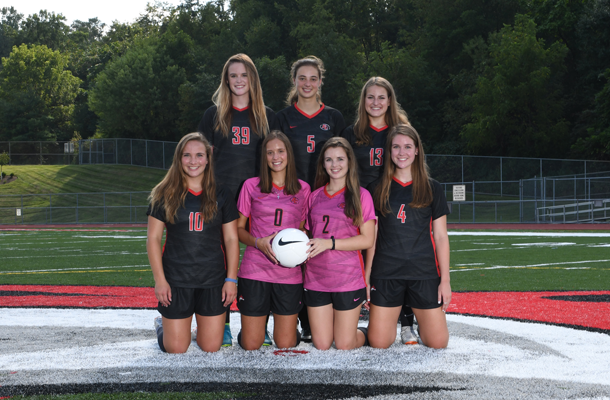 And, for Theresa, Sarah, and fellow seniors Maura Curry, Kate Feczko, Sabrina McQuarrie, Julie Scheffler, and Lexie Schutzman, the standard remains the standard, no matter who the team plays or how tough the competition gets.